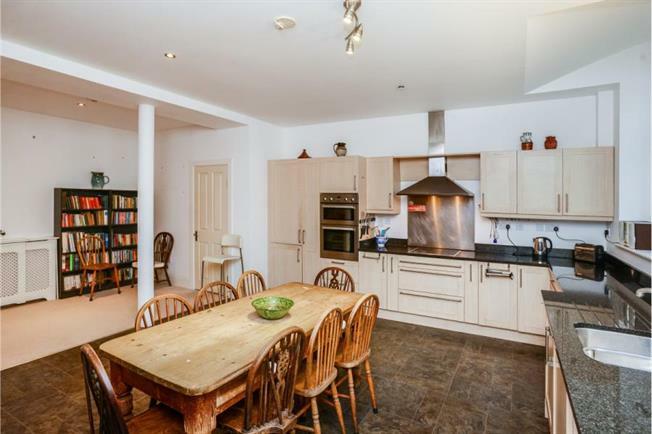 3 Bedroom Upper Floor Flat For Sale in Tavistock for Guide Price £260,000. FEATURED IN THE BIG OPEN HOUSE Guide Price 260,000- 270,000 Conveniently located within walking distance from Tavistock town centre, is this unique and spacious two/three bedroom duplex apartment. Forming part of the beautifully converted Old Chapel, this property has plenty of space and character, is offered with no onward chain and boasts two private parking spaces. On the ground floor the accommodation briefly comprises of a large open plan living area/kitchen, dining area and lounge, laundry/wash room, study and store room. The second floor consists of two/three double bedrooms, master with ensuite bathroom and main family shower room. Outside there is a private sun terrace and communal gardens, with two parking spaces at the front. An internal viewing is highly recommended to truly appreciate this fantastic property. Stairs to first floor, telephone entry system, radiator. Kitchen fitted with a range of wall and base units, one and a half stainless steel sink unit with mixer taps, four ring halogen hob with stainless steel splash backs and extractor canopy over, built in oven and grill, built in fridge and freezer, built in dishwasher, arched window to side. Lounge area consists of three radiators, arched windows to side, under stair storage, built in storage cupboard with access door to maintenance passage. Space and plumbing for washing machine, vent for tumble dryer, wash hand basin, low level W.C, radiator, extractor fan. Outbuilding providing useful storage, window to side. Arched window to side, radiator. Two velux windows, vaulted ceilings with exposed beams, two radiators, eaves storage area. Reduced head height. White suite comprising panelled bath with Mira electric shower over, pedestal wash handbasin, low level W.C, heated towel rail, extractor fan, access to eaves storage. Radiator, window to rear, access to eaves storage cupboards. Radiator, sliding patio doors to terrace, stairs down to lounge area. Tiled corner shower cubicle with mains shower, low level W.C, pedestal wash handbasin, heated towel rail, extractor fan, access to eaves storage. A sheltered and private sun terrace accessed from the third bedroom.